Health care workers are planning to take to the streets Tuesday at a rally in front of the Albany, N.Y. state capitol to protest mandatory vaccination. The rally is intended to call for "freedom of choice in vaccination and health care" and to protest mandatory vaccination for influenza and the H1N1 swine flu. "This vaccine has not been clinically tested to the same degree as the regular flu vaccine," Tara Accavallo, a registered nurse on Long Island, told Newsday. "If something happens to me, if I get seriously injured from this vaccine, who's going to help me?" This raises an obvious and important question: Under what circumstances can government officials order mandatory vaccination? And could the general public be ordered to roll up their sleeves for injections, even if there might be side effects beyond a sore arm or mild fever? 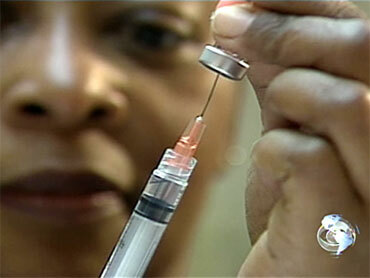 The concern in New York also comes as skepticism of vaccination in general seems to be on the rise. First, some stipulations. Let us stipulate that that routine vaccination has virtually wiped out, at least in developed countries, once-rampant diseases like mumps and whooping cough. The horrors of smallpox -- variola major, which slays about a third of its victims, and the less deadly variola minor -- have vanished, thanks to a successful worldwide vaccination campaign. Even where mandatory vaccination can cause complications, the overall side effects in a population of millions will almost certainly not be as harmful as the infectious disease itself. On the other hand, let us stipulate that not all vaccines are created equal; some may be safer than others. Out of lack of knowledge or fear, officials may order mandatory vaccinations when the vaccine has not been proven completely safe. And we should remember that the history of our own government when it comes to vaccines is not without its low points (more on this below). Perhaps the best overview of the legality of mandatory vaccination lies in a 2005 report prepared for the U.S. Congress by the Congressional Research Service. It notes that while the federal government does have the power to order quarantines, public health has historically been the states' responsibility. The CRS report adds: "Generally, federal regulations authorizing the apprehension, detention, examination, or conditional release of individuals are applicable only to individuals coming into a State or possession from a foreign country... Any federal mandatory vaccination program applicable to the general public would likely incorporate similar jurisdictional limitations." We are not prepared to hold that a minority, residing or remaining in any city or town where smallpox is prevalent, and enjoying the general protection afforded by an organized local government, may thus defy the will of its constituted authorities, acting in good faith for all, under the legislative sanction of the state. If such be the privilege of a minority, then a like privilege would belong to each individual of the community, and the spectacle would be presented of the welfare and safety of an entire population being subordinated to the notions of a single individual who chooses to remain a part of that population. That seems pretty clear. So are the state laws regarding vaccinations for children attending school -- every state requires vaccines such as measles, rubella, and polio, although medical and religious exemptions do exist. A 2007 Texas executive order suggests that young schoolgirls receive the Human Papillomavirus (HPV) vaccine, which appears to have recently killed a 14-year old girl in England, while providing parents with the right to opt out. Back to New York for a moment. State Health Commissioner Richard Daines, who is probably feeling a bit of political pressure after deciding that the Empire State will go where no other state has, released a lengthy open letter last week that concludes: "We, as health care workers, owe it to our patients and to society in general to demonstrate our confidence in those scientific standards. Even more importantly, we should reconfirm our noble commitment to the tradition of putting patients' interests first by supporting the mandatory influenza vaccination requirement." He's also holding a media availability after Tuesday's protest. While no state has gone as far as New York, many other institutions have grappled with the concept of mandatory vaccination. The University of Iowa required all staff to be vaccinated for H1N1, but then backed down in the face of a union lawsuit. The University of Alabama requires proof of meningitis vaccination, without any obvious exceptions. Protests are planned in London on October 3 against mandatory vaccination. All members of the U.S. military will receive the H1N1 vaccine starting in October, according to an American Forces Press Service article. Massachusetts is encouraging its health care workers to be vaccinated against seasonal influenza by December 15, but isn't mandating it; its public health commissioner has even sent out a statement trying to "dispel rumors" about "forced vaccination." "It makes sense to create this two-tiered system in which medically necessary vaccines are linked with narrower exemptions and practically necessary vaccines are instead linked with generous exemptions. So, vaccine laws could explicitly state that parents can exempt their children from hepatitis B and HPV vaccines with no questions asked, unlike vaccines for diseases listed elsewhere in the statute." In general, critics of mandatory vaccination tend to center their objections around side effects, which the Centers for Disease Control and Prevention acknowledge exist, albeit in mild forms. Critics worry about the possibility of a link to autism and the use of a thimerosal, a substance containing mercury that is being phased out, as a preservative; others object on general we-should-decide-this-for-ourselves principles. The Association of American Physicians and Surgeons, a more conservative counterpart to the American Medical Association which opposes mandatory vaccinations for schoolchildren, notes that the vaccine approval process in general has "been contaminated by flawed or incomplete clinical trials." An article in the British Medical Journal from October 2008 (published as part of a debate) argues that: "Although the physical harms from influenza vaccine are generally minor, there are potential psychosocial harms. Mandatory immunisation infringes civil liberty and autonomy." And the free-market Heartland Institute in Chicago, Ill., argues that mandatory vaccination can violate the Hippocratic Oath: "There is no question of the great benefit of general vaccination for such scourges as poliomyelitis, diphtheria, smallpox, etc. But can we say the same for greatly self-limited rotavirus diarrhea in infants, chickenpox for children, or for the sexually transmitted hepatitis B for both?" One example of governmental overreaction to infectious disease came in 1976, when an outbreak of swine flu struck Fort Dix Army base in New Jersey. After a 19-year-old private died, President Gerald Ford ordered a nationwide vaccination program that eventually reached 40 million people, or about 24 percent of the United States population at the time. Without the vaccine, Health Secretary F. David Matthews solemnly predicted at the time: "We will see a return of the 1918 flu virus that is the most virulent form of the flu. In 1918 a half million Americans died. The projections are that this virus will kill one million Americans in 1976." The vaccination program turned out to be a mistake. Reports soon surfaced about the vaccine causing a neuromuscular disorder called Guillain-Barré syndrome, and vaccinations were halted about two months after they began. One million Americans never died.